Release neck pain with these gentle yoga-based stretches. Muscular tension in the shoulders doesn’t just stay there. It often runs up into the neck, causing pain and even headaches. The following stretches will help release tension over time, easing both the neck and shoulders. It is best to perform these stretches without having a headache or head pain, as they can create additional aggravation to the already inflamed area. However, if done every day they will lead to more mobility and more pain-free days. 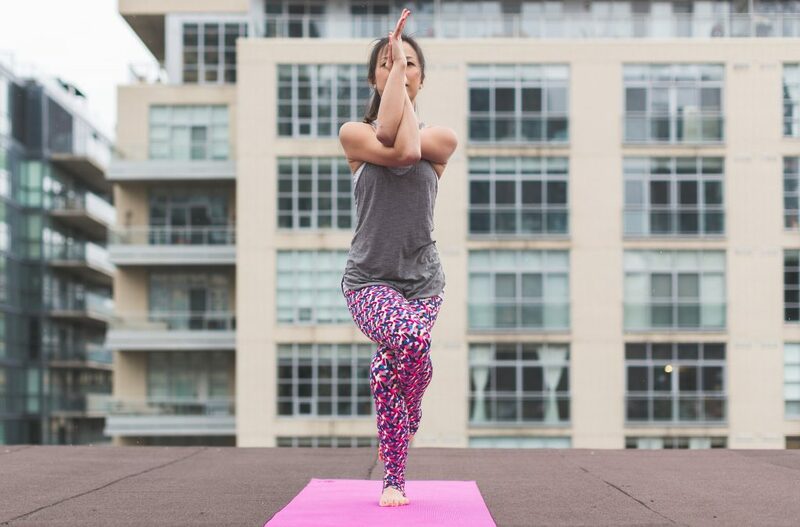 For best results during stretches, make sure to work with the breath, moving deeper into the stretch as you exhale. Another tip: move through shoulder rolls both forward and back in between each stretch. If choosing only one stretch, roll shoulders both before and after. Chest expansion: Reach your hands behind your back as if you have magnets on your palms. Extend your arms fully and roll your shoulders down and back. Stay here to feel more strength. For a deeper stretch, interlace your hands together. Another helpful option is to hold a strap taut between your hands and gently pull away. Eagle arms: Start with a simple shoulder stretch, gently pulling your arm across your body with both shoulders relaxed and down. For more sensation, take your opposite arm on top and entwine your arms so a deep stretch is felt from behind our shoulder blades. Hold for about 30 seconds and then change sides. >Cow-faced arms: Start with a tricep stretch. Lift one arm up and gently press your hand down your back with your opposite hand. To build upon the stretch, reach behind your back and slide your hand up until it meets the other hand. It’s important not to strain into this pose, so if more length is needed to reach your hands together, hold a strap in between. This way, the stretch will be safe and felt evenly. Thread the needle: Coming onto all fours, begin to slide one arm on the floor behind the other. Move slowly to maintain control of the stretch on the way through, pausing as needed. To move into the full stretch, slide the arm through until it rests on the floor and you feel a deep stretch through your shoulder. Then use the opposite hand to gently press the floor away and build into a small twist, opening the muscles of your upper back. Gentle neck stretch: After the neck and shoulders are feeling warm from the previous stretches, with utmost caution begin to stretch the muscles of the neck. Very gently and with little pressure, bend your neck to the right, bringing your right hand up to carefully draw your head toward your shoulder. Stop if you feel any sensation. Less is certainly more for this stretch. Coming back up through centre, bring both hands behind your head and gently draw your chin towards your chest. Return to an upright position and then continue on to the left side. Repeat a few times as needed. Lisa Greenbaum, E-RYT 500 is a YogaFit Senior Master Trainer, International Presenter and avid writer. She teaches yoga in Toronto. Download the workout canoeist Andrew Russell follows at the gym to keep up his strength.